Surf Lakes Limited has invented a revolutionary, proprietary method of produce high quality surfing waves in a controlled lake environment. The Surf Lakes™ technology will be capable of producing a variety of waves that closely mimic natural ocean waves. Due to many limiting factors, less than 1% of the worlds population has ever surfed. By creating perfect waves, on demand 24/7 and delivering them to the masses globally, Surf Lakes has an exciting future. And with surfing admitted to the Tokyo Olympics in 2020, the potential for Surf Lakes globally is significant. The 1999 World Surfing Champion and former Pipe Master, Mark “Occy” Occhilupo, has announced he is behind Surf Lakes, the company which has developed Australia’s first surf technology and is currently building Australia’s first surf park. When complete, Surf Lakes will be the first surf park in the world capable of producing eight separate waves simultaneously. The waves will vary in size and length, allowing for beginners through to experts to surf at the same time. By using concentric waves and multiple point breaks, Surf Lakes is capable of producing more waves per hour than Wavegarden’s Cove or Kelly Slater’s wave pool (2,400 vs 1,000 vs 15 respectively), while also offering a variety of waves from hollow barrels, to gentle beginner waves. 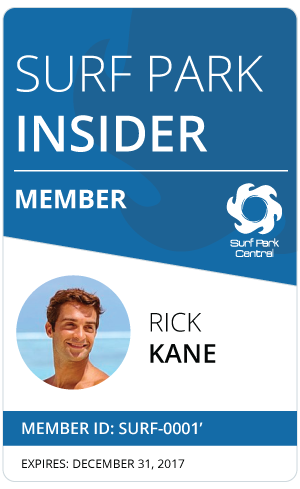 Occy has joined Surf Lakes as its Surf Industry Advisor, providing valuable input into wave design. He is also designing his own break, called “Occy’s Peak”, a barreling left hander that will be 2.4 meters face height (8′) and run for about 60 meters. The 1999 World Champion and former Pipeline Master said: “Being able to design the perfect wave, then catch it over and over again, is every surfer’s dream, which contrasts with the ocean where the perfect wave is rare. “What’s even more exciting is that it provides fun for the entire family and I am looking forward to bringing mine to the Surf Lake and seeing the kids surf different waves at the same time,” Occy said. This is the first dedicated surf park to commence construction in Australia. Initially it will be used a demonstration site as the company intends to license its technology around the world to theme parks and resorts and property developers. According to Surf Lakes founder and CEO, Aaron Trevis, the goal is to make surfing more accessible, bring it to the masses and to people who currently don’t have access to the ocean or waves. “While surfing is a popular sport in Australia, 99.5 per cent of the world’s population have never surfed, which is why we believe there is a significant opportunity for the Surf Lakes technology,” Mr Trevis said. “Surfing is a significant part of our culture and we believe Surf Lakes will provide many opportunities for surf schools, elite training or just for leisure, and with surfing now an Olympic sport, we believe it will be beneficial to national teams for training purposes or even the actual competition,” Mr Trevis said. Completion is scheduled for late 2017 and when finished it will have the same water volume of approximately 20 Olympic swimming pools. Surf Lakes is backed by its Board and a group of Australian investors. Surf Lakes is currently raising the final round of capital to complete construction and launch the product to the global market. The capital raise is being managed by Axstra Capital. I would like to know what the mean power consumption will be, in MegaWatts, and the maximum wave height it will produce. The laws of physics are quite explicit. Yes but the imaginative engineering of man can almost bend those laws. bypigglywigglyoinkoink or was it pigllywiglly oink? I think the right calculation is about power consumption per human joy. the rest is just bs.